Despite the rather ambiguous ending to God of War 3 (I don’t want to spoil it for those who didn’t play it… but if you haven’t, you should), I was pretty melancholy because, at the time, I thought that was the end of one of my most favorite characters in gaming. Kratos’ tale of bloodthirsty vengeance was epic in every sense of the word. So when a prequel was announced I did a happy dance! 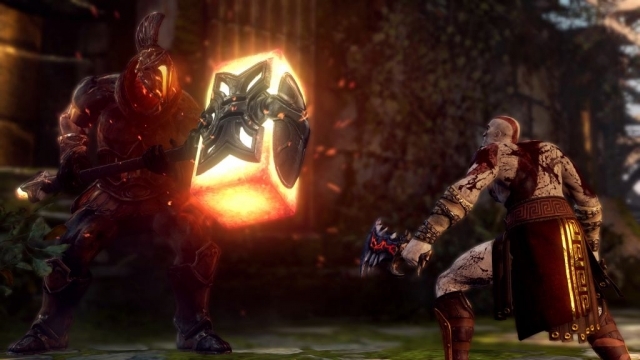 Kratos is back in God of War: Ascension! Unfortunately, it pains me to say it’s the worst game in the series to date. Don’t get me wrong, Ascension is still an excellent game… it just doesn’t stand up to the admittedly impossibly high standards we’ve come to expect from the series. Something about Ascension just feels off, but it’s hard to put a finger on why. First, the formula is starting to feel too familiar. That’s something I never thought I’d say. But this is the sixth time we’ve done this. That’s not necessarily a bad thing, but a cold statement of fact. Another issue is with the story, which is close to non-existent. The Furies, immortal sisters neither god nor titan but punishers of oath breakers, are now the enemy. Unfortunately, they simply don’t hold the same panache as Zeus or Poseidon. Sadly, Kratos’ character isn’t really developed any further either. I think everyone was hoping for more of a catharsis style understanding of our anti-hero. We know what has to happen for the rest of the series to make sense; that is the inherent difficulty with prequels. The combat is as satisfying and brutal as we have come to expect. No game makes you feel more badass than God of War. Unfortunately, it hasn’t evolved much either. Long time fans will feel immediately at home spinning the Blades of Chaos, building up Kratos’ rage to unleash different combos, using area clearing magic when things get too intense, and then finishing them off with a savage quick time event. It’s a tried and true formula that has worked so far but again, we’ve been doing this for six games running. However, there have been a few minor tweaks worth mentioning. It’s harder to fill up your rage meter and, more annoyingly, it doesn’t last nearly as long as it should. This is important because Ascension eschews some of the bigger boss fights we’ve come to know and love in favor of more arena style combat against swarms of enemies. The problem is that, for the first time in the series, these tend to feel repeated rather than organic and fluid. Proactive use of your built-up rage is critical in keeping an upper hand in corralling the multitude of foes that are thrown at you at any one time. It also seems like in too many areas you are doomed to die until you learn the pattern. Previous entries have been hindered by similar issues, but Ascension borders on genuine frustration. 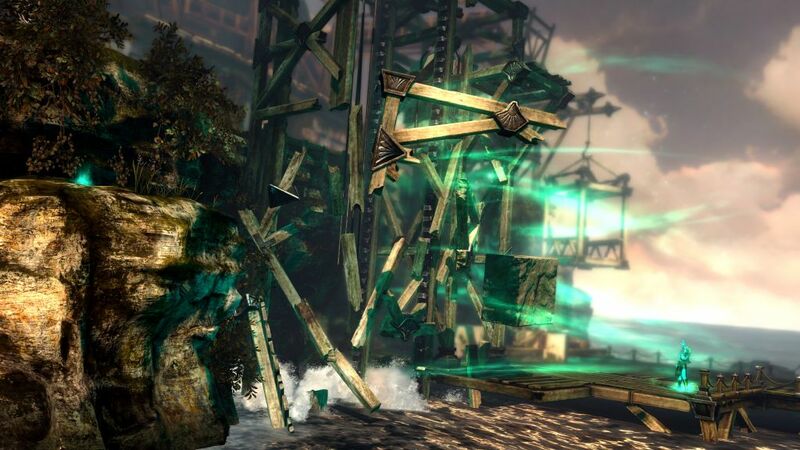 This isn’t limited to quick time events either, but rather platforming elements that come at you so fast that you need to learn the correct path by trial and error rather than skill. I remember at one point I got past a particularly difficult section (mostly by luck) on the first try only to die shortly thereafter… then I was stuck back on the first bit for entirely too long! The new magic system is cool, if inherently flawed. 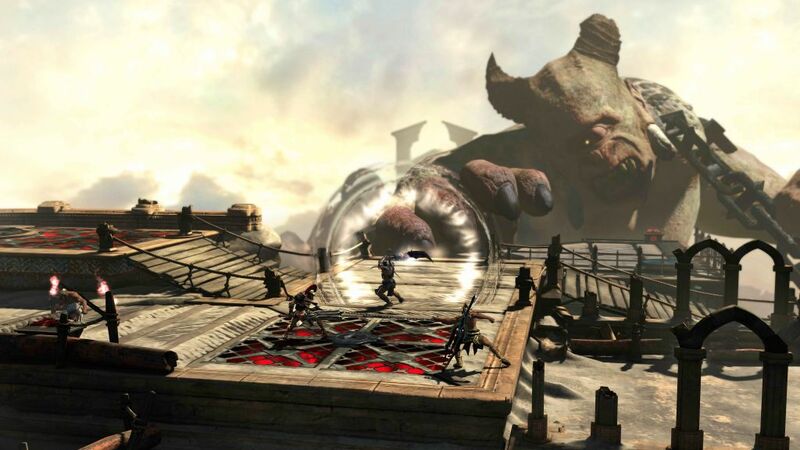 Rather than a slew of underused secondary weapons, Santa Monica Studios tied each elemental attack (fire for Ares, lightning for Zeus and so on) to the Blades of Chaos. There are different moves, combos, and magic to unlock. The problem is that the actual area-of-effect magic attacks are only available at the top of each skill tree. Long time fans know that collecting enough red orbs to power everything is virtually impossible in one playthrough, but I didn’t even see two of the magic attacks. As always, it’s wise to save your magic for those moments when you really need it. Graphically, God of War: Ascension maintains the high level we have come to expect. The lighting in particular is stunning, as are the texture effects. But while the graphics are still some of the best out there, in too many cases the scale is simply too big. How can you go too big in God of War? We’ve battled on the backs of titans scaling Olympus for heaven’s sake. 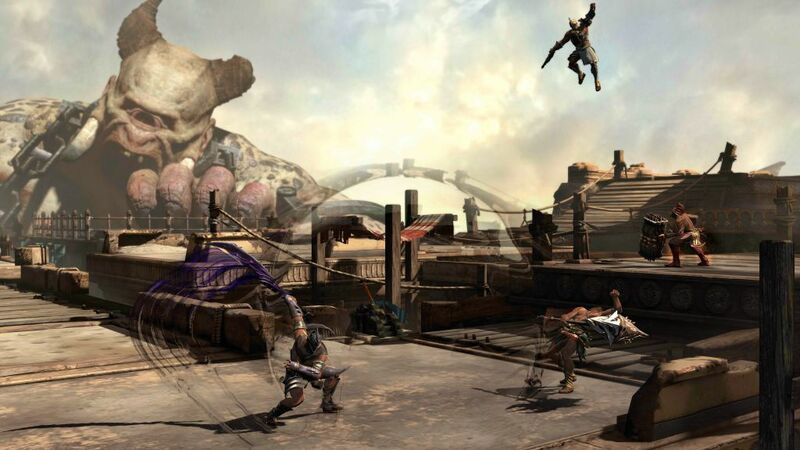 But when the action is so far away you can’t tell who Kratos is in the muddle of bad guys and whirling blades, it takes away from the very thing you are trying to get us to notice. We get that you are going for a sense of scale, but that can be accomplished with swooping camera angles (another series staple) then zooming in on the action, not the other way around. 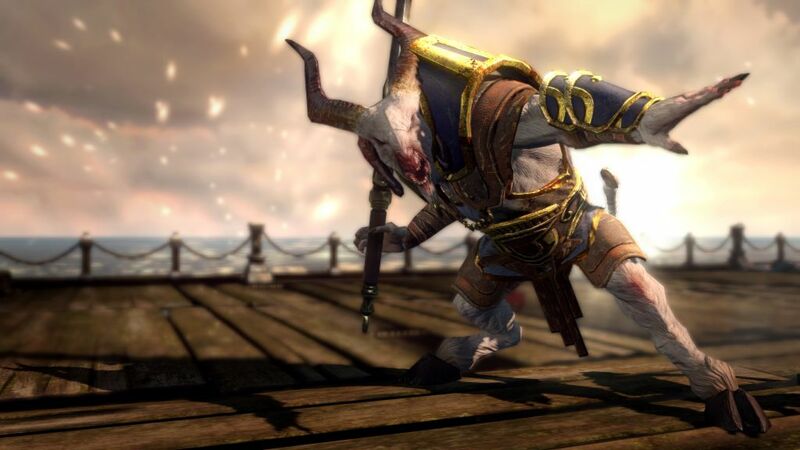 Believe it or not, this is probably the most brutal God of War to date. This is naturally helped by the high level of graphical fidelity, but it’s still difficult not to wince when the Blades of Chaos do their work… unless your sick in the head like me. If you enjoy wanton carnage then you’re most likely pumping your fist when a gorgon gets cut in half the long way or a gigantic elephant enforcer is lobotomized. I like the fact that you don’t have to actively save. Checkpoints are liberally sprinkled about so dying (and you will, a lot, this is also probably the most difficult game in the series to date) isn’t as frustrating… until you get to the much talked about Trial of Archimedes. This is particularly brutal on the player, and may even put more casual fans off. It’s very important to pay attention to using magic as much as you can. 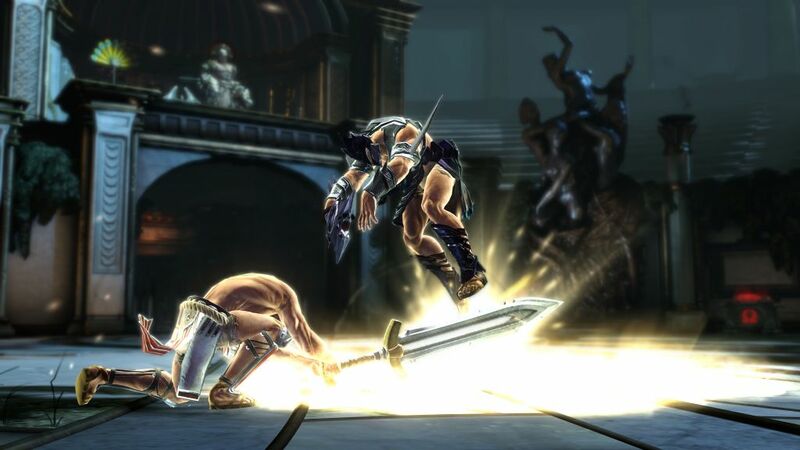 Here’s a hint: use the Hades power on your blades because you can get green orbs when successfully using it to finish your foes. It’s no surprise that the biggest addition to Ascension is the inclusion of multiplayer. Multiplayer aspects have wormed their way into virtually every single player experience out there. Sometimes this is for the better, while other times it is decidedly for worse. Fortunately, it doesn’t feel tacked on here. The multiplayer is interesting… there aren’t many hack and slashers that can work in this formula (Ninja Gaiden 3 was actually fun in multiplayer, despite how atrocious that game was). Different classes are aligned with different gods, each one with different strengths. Once you pick a god to fight for, there are various upgrades to earn. There are a slew of different modes to try, and they are fun despite being stock and standard. The multiplayer experience is fun, but not very evolved. Only true aficionados will stick with it for any length of time. I know I’ve come across as overly critical in this review, but it’s simply because I’m such a fan of the Ghost of Sparta. 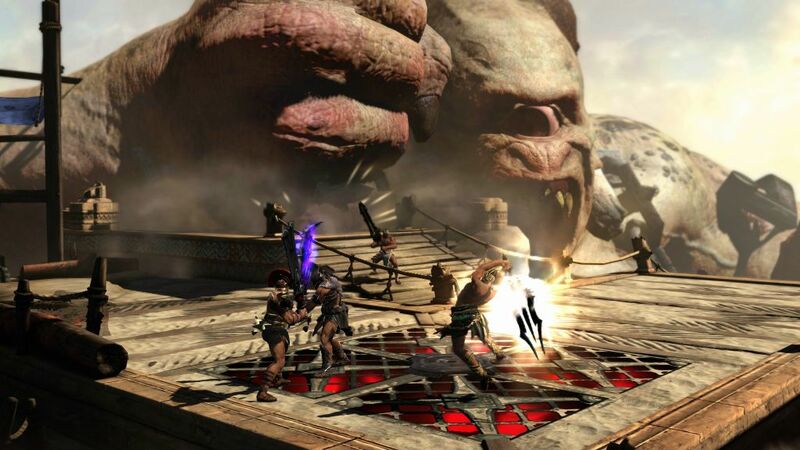 God of War: Ascension isn’t a bad game by any stretch of the imagination, but considering it’s lineage, it feels like a step back rather than a step forward. 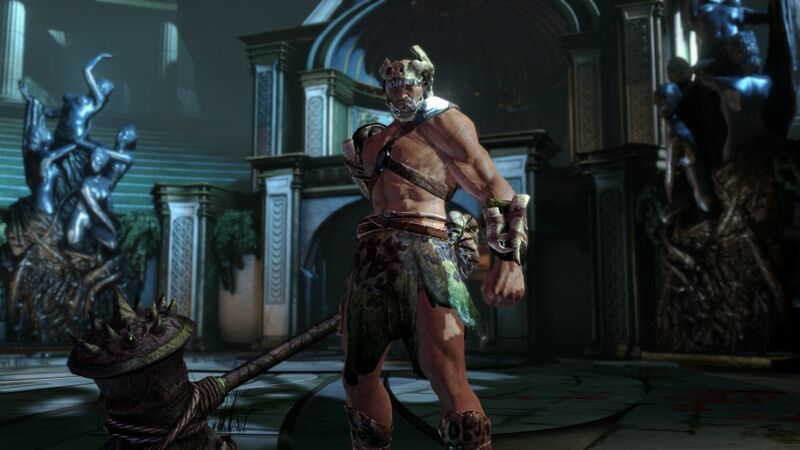 We know this isn’t Kratos’ last hurrah, but here’s hoping he comes back with a vengeance! 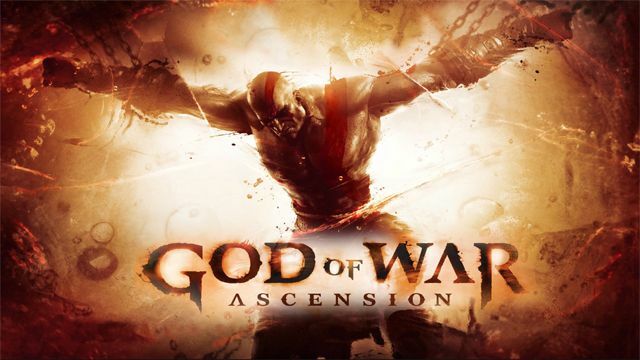 This review is based on a copy of God of War: Ascension for the PlayStation 3 provided by Sony Computer Entertainment.